Cuprian Elbaite: Mineral information, data and localities. 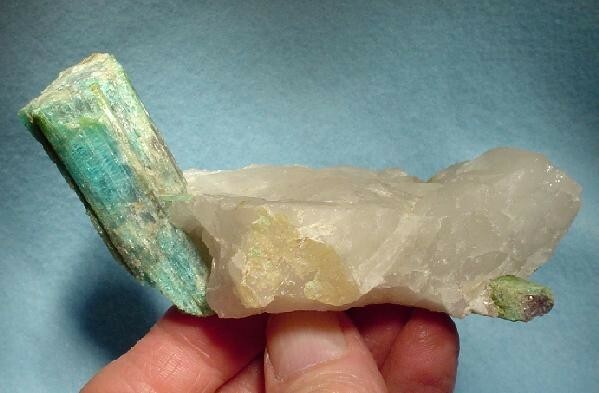 A Cu-bearing variety of elbaite. This material, when used as a gemstone, has been assigned a new formal commercial trade name by the Laboratory Manual Harmonization Committee (LMHC), a group of 7 gemmological laboratories worldwide - Paraíba Tourmaline, regardless of locality of occurrence. Visit gemdat.org for gemological information about Cuprian Elbaite. 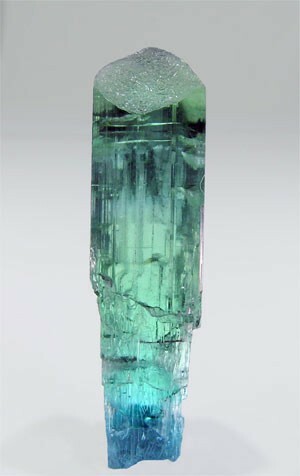 Paraíba Tourmaline An electrifying blue-to-green coloured, gemmy, variety of cuprian elbaite. 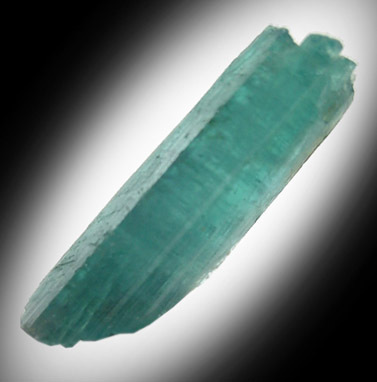 In mineralogical terms, Paraiba Tourmaline should refer only to tourmaline from the original source, Paraíba, Brazil. Quartz 3 photos of Cuprian Elbaite associated with Quartz on mindat.org. Milky Quartz 2 photos of Cuprian Elbaite associated with Milky Quartz on mindat.org. Lepidolite 1 photo of Cuprian Elbaite associated with Lepidolite on mindat.org. Henn, U., Bank, H. & Bank, F.H. (1990): Transparent bright blue Cu-bearing tourmalines from Paraiba, Brazil. Mineral. Mag. 54, 553-557. 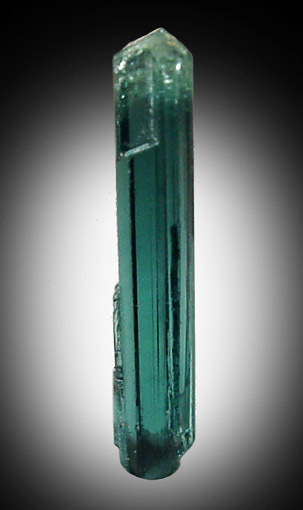 MacDonald, D. J. and Hawthorne, F. C. (1995): Cu-bearing tourmaline from Paraiba, Brazil. Acta Crystallographica, C51, 555-557. Colored Stone (2006): Selling News: "Labs to Use Paraíba": 19(4): 22. Beurlen, H., de Moura, O. J., Soares, D. R., Da Silva, M. R., & Rhede, D. (2011): Geochemical and geological controls on the genesis of gem-quality “Paraíba Tourmaline” in granitic pegmatites from northeastern Brazil. The Canadian Mineralogist, 49(1), 277-300. Ludwig, T.; Marschall, H.R. ; von Strandmann, P. A. E. Pogge; Shabaga, B.M. ; Fayek, M.; Hawthorne, F.C. (2011): A secondary ion mass spectrometry (SIMS) re-evaluation of B and Li isotopic compositions of Cu-bearing elbaite from three global localities. Mineralogical Magazine, 75, 2485-2494. Sugiyama, K., Arima, H., Konno, H., Mikouchi, T. (2017): XAFS study on the location of Cu and Mn in a greenish blue elbaite from Alto dos Quntos [sic] mine, Brazil. Journal of Mineralogical and Petrological Sciences 112, 139-146. Wilson, W. E. (2002): Cuprian elbaite from the Batalha Mine, Paraíba, Brazil. Mineralogical Record, 33: 127-137; de Brito Barreto, S., & Bretas Bittar, S. M. (2010). Los depósitos de gemas de Brasil: localización, producción e impacto económico. Boletín de la Sociedad Geológica Mexicana, 62(1), 123-140. Soares, D. R., Beurlen, H., da Silva, M. R. R., da Silveira Gonzaga, F. D. A., dos Santos Filho, J. I., & de Oliveira, H. B. L. (2018). Variedades Gemológicas De Minerais Da Província Pegmatítica Da Borborema, NE Do Brasil: Uma Síntese. Estudos Geológicos, 28, 1. Beurlen, H.; Müller, A.; Silva, D.; Da Silva, M.R.R. (2011): Petrogenetic significance of LA-ICP-MS trace-element data on quartz from the Borborema Pegmatite Province, northeast Brazil. Mineralogical Magazine 75, 2703-2719.
http://www.gia.edu/loupeonline/29962/30252/2724/current_issue_detail.cfm ; Ludwig, T., Marschall, H. R., von Strandmann, P. P., Shabaga, B. M., Fayek, M., & Hawthorne, F. C. (2011). A secondary ion mass spectrometry (SIMS) re-evaluation of B and Li isotopic compositions of Cu-bearing elbaite from three global localities. Mineralogical Magazine, 75(4), 2485-2494. Ludwig, T., Marschall, H. R., von Strandmann, P. P., Shabaga, B. M., Fayek, M., & Hawthorne, F. C. (2011). A secondary ion mass spectrometry (SIMS) re-evaluation of B and Li isotopic compositions of Cu-bearing elbaite from three global localities. Mineralogical Magazine, 75(4), 2485-2494.